Would any of you ladies date that.... Never mind. Too damn easy. Hey i remember that guy. Back in high school his nickname was dishes, because we caught him in the bathroom with dish detergent. (His name over the loudspeaker) Party of one. Your table is ready sir. Ha ha ha, no no the "t" is silent. Hello, may I help you? Sir are you aware of what's on your name tag? Yes I am, that's my real name.. GOODBYE! 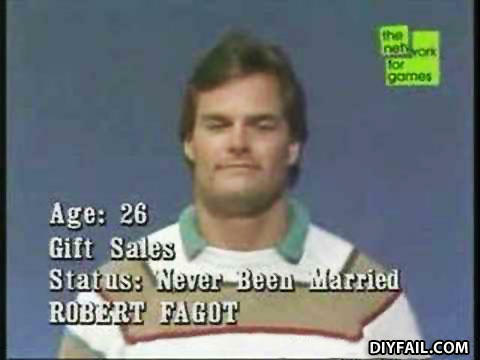 Status : Never been Married .I guess i know why. Robert, how's your sales going this month. Not so good boss. Not so good. Bob, there's a Mr. Packer holding for you on line two. Q: How many lightbulbs does it take to screw in a dog house, if your parents are a washing machine and a dryer?